As summer approaches, many dog lovers will be hitting the roads with their dogs. 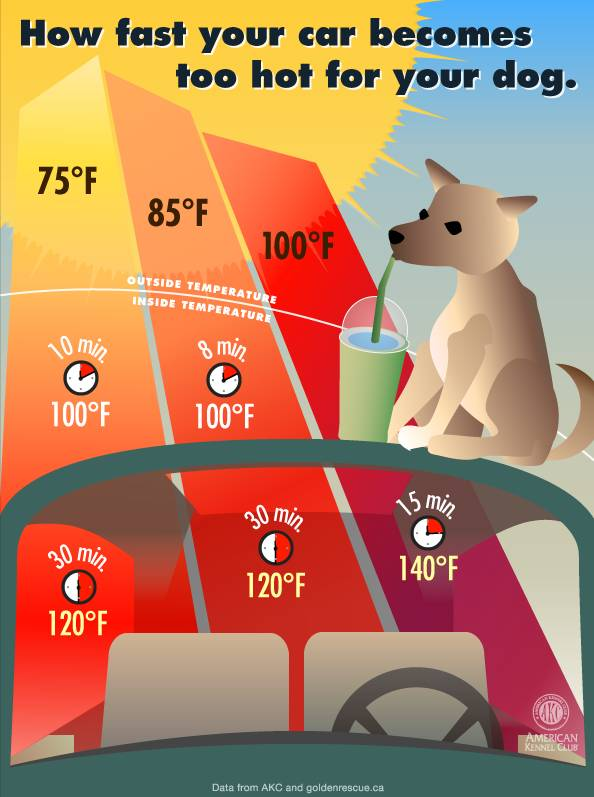 Traveling with your dogs – whether to a dog event, a vacation, or even just a trip to the park – is a great way to bond, but as the temperatures rise it’s important to make sure your dogs are never kept in a vehicle when the temperature is too high. Legislators in several states have become concerned with this, and the AKC supports their efforts to pass laws that hold dog owners accountable for leaving dogs unattended in vehicles when the temperature could endanger the health or life of the dog and the owner has made no effort to provide proper ventilation or other protection. In 2013, for example, AKC supported a bill in North Carolina that in part would allow firefighters, animal control officers and rescue squad workers to remove animals from vehicles if it is believed the dog’s health or life is in danger. A reasonable effort must first be made to find the owner. This bill became law in July 2013. New York law, which is supported by the AKC, currently allows for dogs to be kept in vehicles if there is proper ventilation or other protection from the elements. Police officers and peace officers are permitted to remove the animal from the car if it is in danger, as long as they leave a written notice stating where the animal was taken. Currently a bill is pending in the New York Senate that would expand the law to further protect dogs. Senate Bill 6418 clarifies that a person will be fined if they keep a dog in a vehicle in dangerous conditions even if it wasn’t intentional. It also allows officers to remove the dog from the car if the confinement may place the animal in imminent danger of death or serious physical injury. The officers would still be required to leave a notice on the vehicle, and owners may still keep dogs in the car if there is proper ventilation, air conditioning, or other protection. The AKC appreciates and supports the efforts of legislators to encourage responsible dog ownership by holding owners accountable for keeping their dogs unattended in a car when the temperature is too extreme. We also hope that this, combined with our public education efforts, will help dog owners recognize that vehicles can get hot very quickly and owners should take a minute to consider the dog’s health before leaving it in the car.